Total water care for your household in one unit. The TotalCare conditioners use patented self-monitoring technology to disinfect your system. Our exclusive Crystal-Right™ media softens water and removes unpleasant taste and odor. TotalCare conditioners even correct acidic water conditions in order to preserve your household piping and fixtures. Using a patented disinfection system, TotalCare removes unwanted iron and sulfate-reducing bacteria (SRB) – the cause of distasteful, foul smelling water, as well as the slime-like coating inside your plumbing. 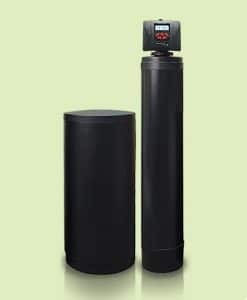 For larger and heavy-use households, TotalCare has as a twin system to provide you with high capacity water treatment available when you need it – 24 hours a day, 7 days a week.